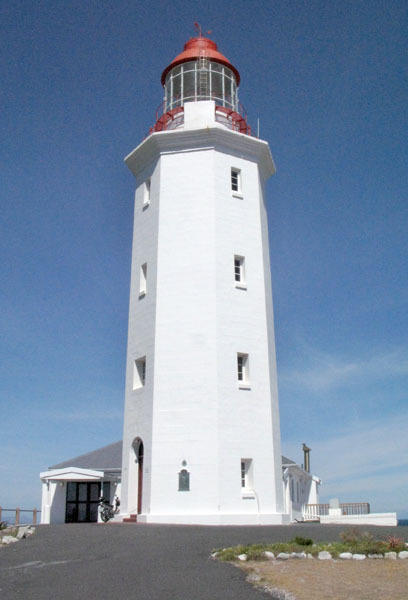 Gone Fishing » Blog Archive » Kleinbaai & Danger Point Lighthouse. 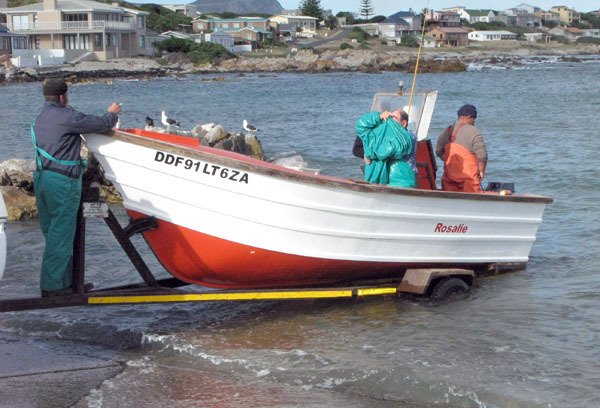 Kleinbaai is a picturesque little village situated on the Eastern side of Gansbaai and is the ideal launching site for the local fishermen to fish in the Dyer Island area. 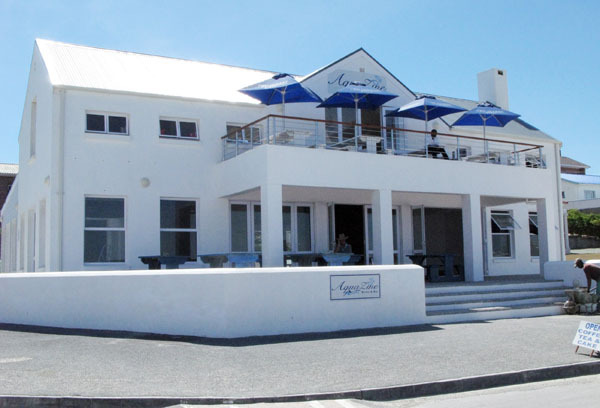 Stories about the Big White Sharks led to the establishment of the now very popular shark-diving expeditions which has resulted in Gansbaai being known as the Great White Shark capital of the world. 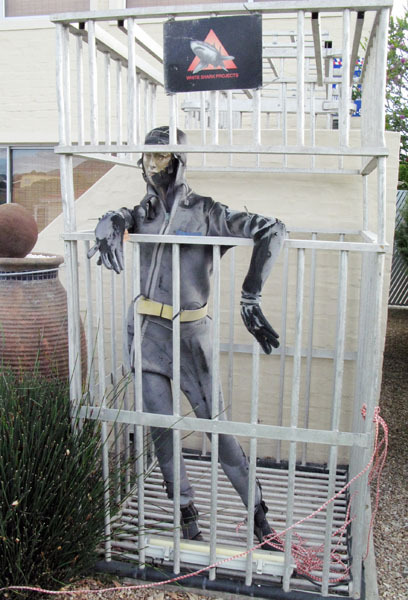 Old shark diving cage. Don't think you want to leave your arm hanging out quite like that. 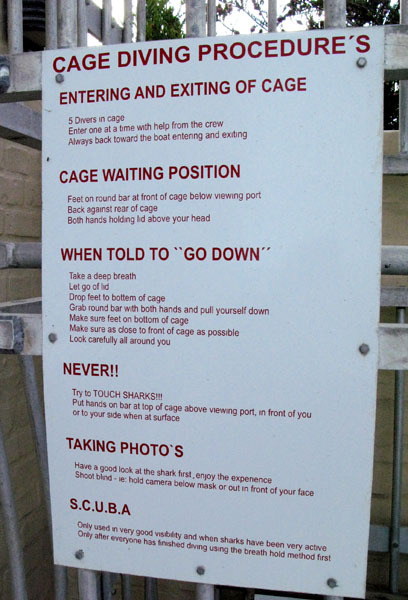 You want to make darn sure you know the rules before you try cage diving if you want to keep all your limbs. 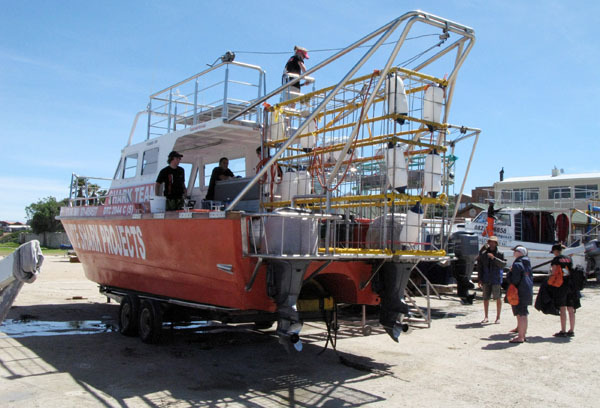 I was lucky enough to go out on one of the boats and I am going to be doing a post about the cage diving at a later date so won’t go into much detail now. 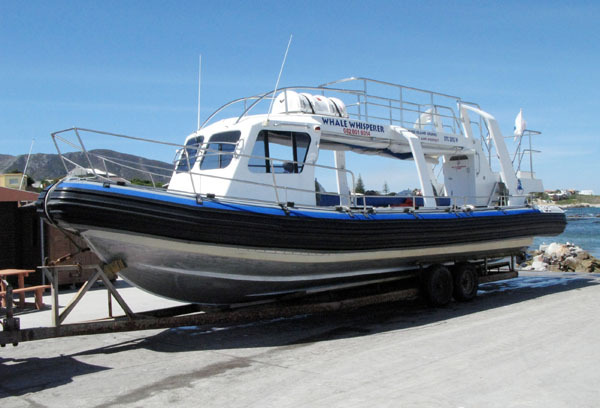 One of the seven shark boats operating out of Kleinbaai most days of the week. It's not only about sharks and this boat, "The Whale Whisperer" takes people out to view the whales which are also plentiful in the area. If you are not really into going out to sea there is also a very nice restaurant which overlooks the harbor. 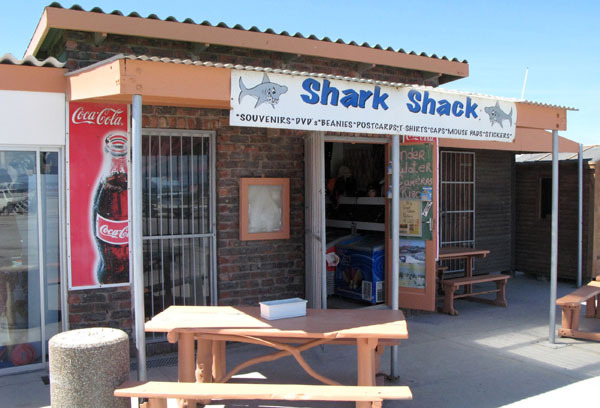 Or you could pop in and buy some souvenirs here and tell all your friends how you went diving with the Great Whites. I was fortunate that I bumped into my fishing friends, who I had met while at Yzerfontein, and it was through one of them that I got to go out on one of the shark boats and take some photos. 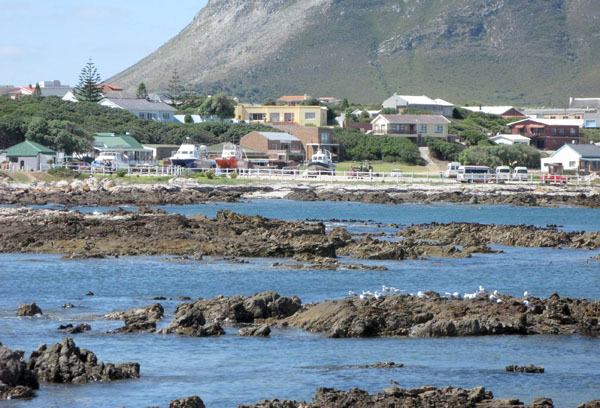 Kleinbaai is not only about the shark and whale watching but there is also a golf course, squash courts, tidal pool for safe swimming and some great hiking trails one of which is along the peninsula of Danger Point which extends about 8 kilometers into the sea. The rocky Danger Point shore line looking back towards Kleinbaai. The many reefs and unchartered rocks along the shoreline make it one of the most dangerous places in the world for ships sailing too close inshore. A hidden rock lurks just below the surface off the Point and it was on this rock that the legendary HMS Birkenhead met her doom in 1852. This rock can be seen at low tide just a few kilometers off Danger Point. 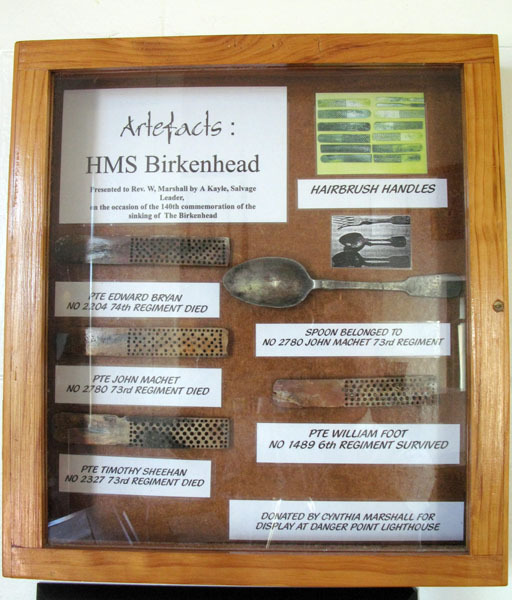 Seven shipwrecks surround Danger Point and 140 wrecks are dotted along the shores between Danger Point and Cape Infanta. 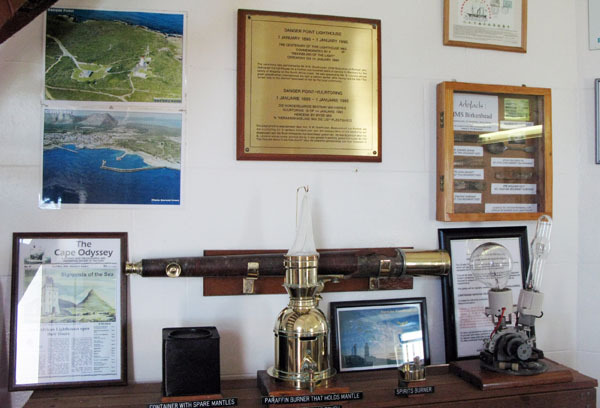 Danger Point Lighthouse, erected in 1895, which was too late to for the troop ship Birkenhead which floundered on the 26th of February 1852 with only 193 survivors out of the 636 souls on board. 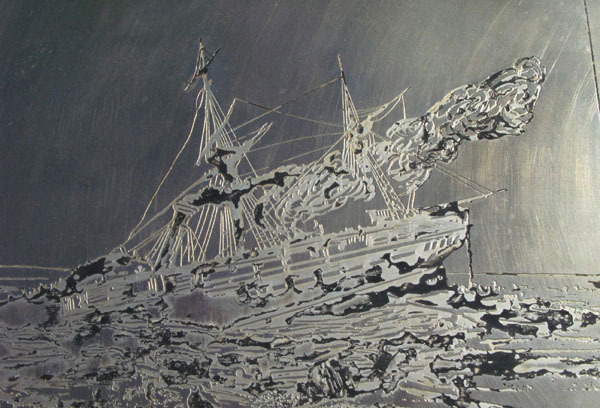 An etching of the Birkenhead floundering off Danger Point. 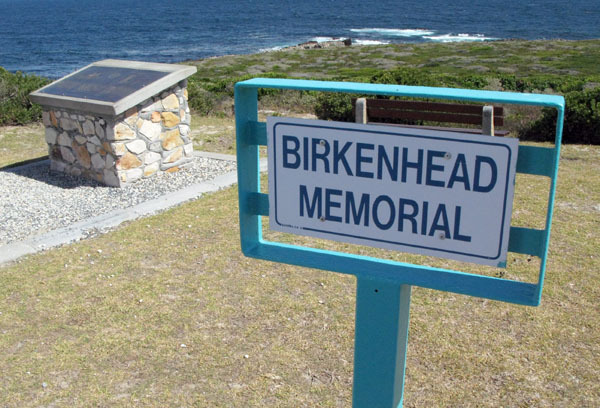 Birkenhead Memorial at Danger Point Lighthouse. All in all I found this a very interesting area to explore and in my next post I am going to follow a group who decided to to go shark cage diving with one of the operators, Marine Dynamics, just off nearby Dyer Island. In 1961 our family stayed in the left semi-detached house at the bottom of the hill at Danger Point. The grave under the tree is my late brother. In 1973 I was also a relief keeper there. I did subA & sub B at Gansbaai Primary School! Really informative and interesting blog Mr. Bromilow-Downing! We love camping, I’m sure this is going to help us a lot. wow, what a collection of photos, just make me wanna go down to Gansbaai and Hermanus.